This conversation is brought to you by Wayfair and my need to declutter! I’m very excited to share with you my first success story on my year long Live With Less journey. If you don’t know what I’m talking about you can read more about that here. I started with an area that I was decently happy with. A year ago I could barely shut the door on this linen closet but my sweet husband helped me clean it out while I was nine months pregnant and in hard-core nesting mode. Here’s how the closet looked today before I decluttered and organized it. It’s not terrible but it’s FULL of too much stuff. Things we don’t use and keep just in case… you know, in case twenty surprise guests want to come for the night. Ridiculous! First, I took everything out of the closet and started started piling up the items I knew I didn’t want anymore. I tossed old throw blankets that I never used into that pile, an old down comforter my husband used before we were married, rugs I used in my house before we were married, and pillowcases with no matching sheets (Where did those come from?!). All of the sentimental and useful afghans and blankets were added to the bottom shelf and the floor. Then I took a look at the abundance of towels I had. I kept enough hand towels to have one out and one in the wash for every bathroom. I thought about the largest family that comes to visit us and I set aside one towel and wash cloth for each of them. The rest went into the donate pile. 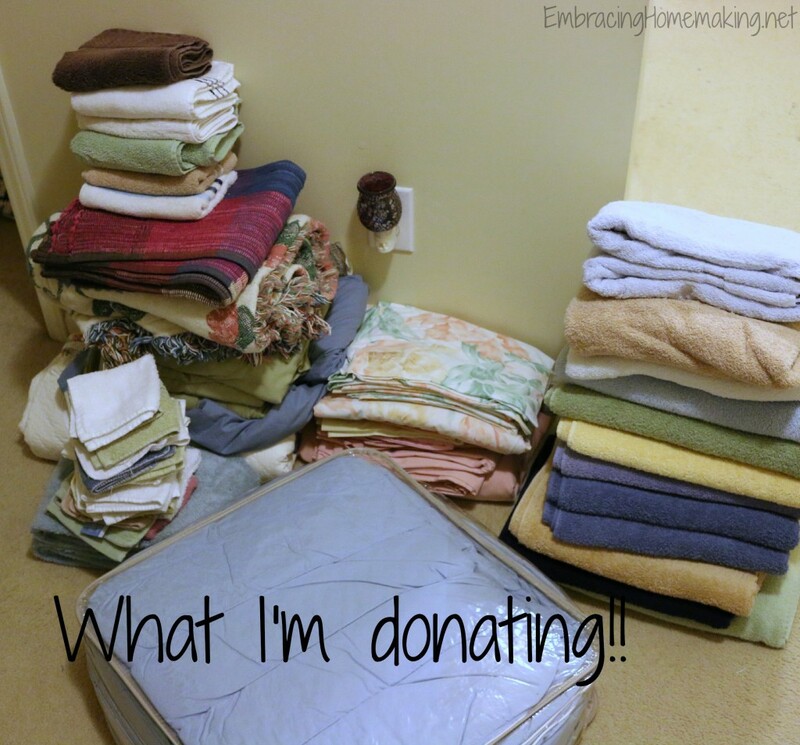 Check out my donate pile. I’m pretty proud of it! Next, I folded my towels nice and neat. Then I grabbed two of my new baskets I ordered from Wayfair last week and threw my spare bed sheets in them. One has spare sheets for our queen bed and the other holds spare sheets for our guest beds. The kids keep their spare sheets in their closets. 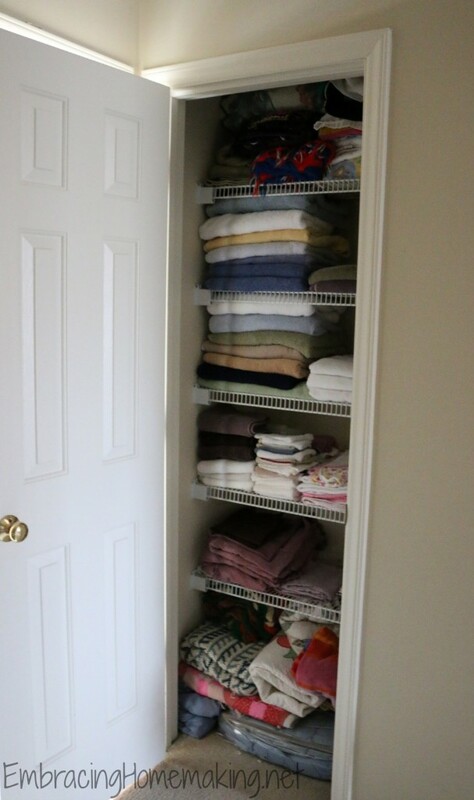 I used my last basket to store the towels and wash clothes that my daughter and son use. Their wash cloths are smaller than adult ones and can quickly become jumbled. This basket keeps them neat and tidy…or at least together and hidden. : ) I love it! Here’s what it looks like now…at night. I’ll have to take another picture tomorrow to show you when the lighting is better but I was so excited that I wanted to show you my progress right away! Doesn’t it look great? That’s not all! I’m going to make labels to tie to each basket to label what’s inside of each one. I have also ordered a new ironing board AND an ironing board holder. This is a game changer!! I’ve never had an ironing board holder before or even knew they existed really. I have just always stored it awkwardly in my closet. Those days are over because I bought an over the door ironing board holder. It should arrive Wednesday and I’ll show you a picture then with my new, sturdy, non-wobbly ironing board hanging on the door of my linen closet. The hanger even has a hook to store my iron. I’m not sure if I’m conveying my emotion but I AM GIDDY with excitement. My little organization-loving heart is happy. This week clean out one drawer (or closet if you’re so motivated). 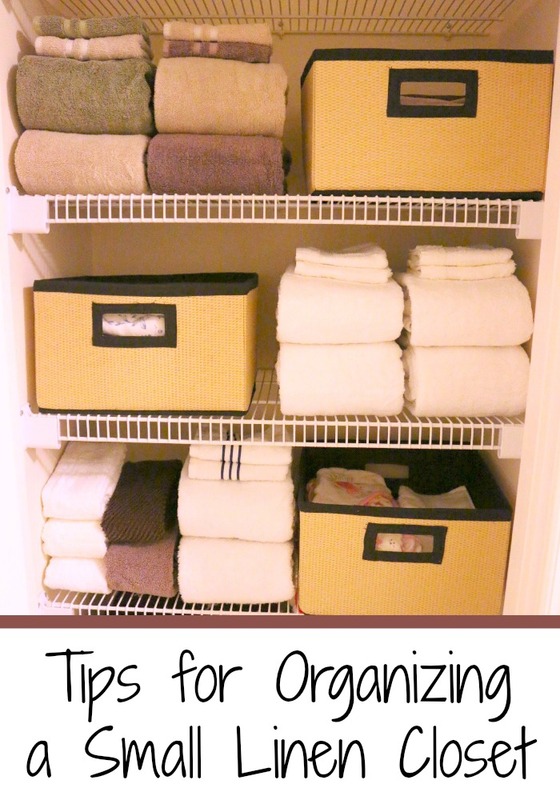 Throw away, donate, sort, and organize. One drawer, that’s it. If after you’ve cleaned one drawer and you feel like tackling more, go for it! If not, no worries. Oh, and I want to see your before and after pictures!! Share on social media with the hashtag #LiveWithLess so I can follow along with your progress. If you’re a member of our Live With Less Facebook group share your picture there as well to help encourage others in the fight against excess. What drawer will you be cleaning this week? I cleaned out my own closet and my girls one and will be moving on to do the boys in their room tomorrow. Forgot to take any pictures today . I’m on my 52 day challenge to declutter my house.